The change, which stipulates that Mediterranean fruit flies, rather than human beings, will henceforth be the only species permitted to hold the top post within the Italian government, is expected to bring a welcome sense of stability to the tumultuous Italian political scene. The decision follows many decades of political chaos and disarray. The nine days prior to the announcement, which was welcomed by politicians, pundits and the populace alike, saw Italy's government change hands a record 339 times, or about once every 38 minutes. “The Mediterranean fruit fly, or medfly, is just what we need to give the citizens of Italy the solid political foundation they so urgently need,” Luciano Illumo, ex-spokesman for newly-elected outgoing Prime Minister Bertolino Bartolomo, said. Traditional Mediterranean fruit flies, which have an average life span of 22 days and a brain that weighs less than 0.003 grams, would in many cases be considered unfit to run the Italian government, according to Gerardo Deparduno, entomology professor at the Universita di Garbagio in Naples. However, “the fruit fly populations from which Prime Minister candidates will be selected are custom-bred and highly specialized,” he said. 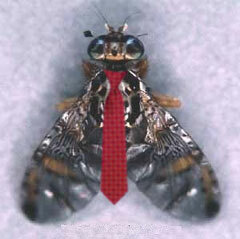 According to Dr. Verdi, the fruit fly populations have been diversified into multiple subspecies, each with an instinctive set of opinions, attitudes, loyalties and platform planks pre-tuned for a particular political affiliation. “After a one-day election campaign and a 60-minute election, a freshly-hatched candidate can get right to work,” he said. Stocks on Italy's MIBTel index rose over 9% on the announcement.